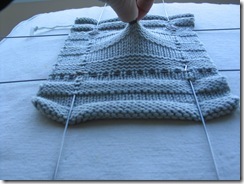 NOTE: This is the first tutorial on gauge. 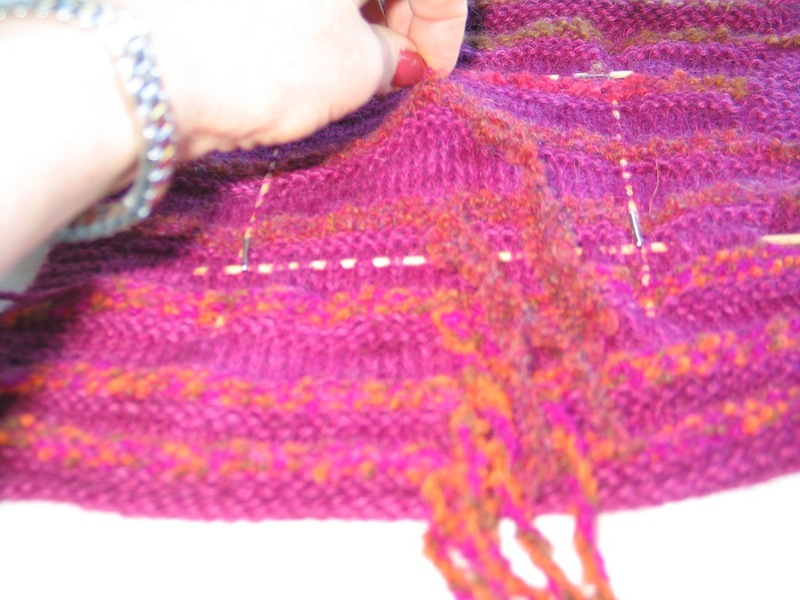 It was my best effort at the time, but after a year and half of working workshops, trunk shows and knitting events, I found what I hope are better, and more succinct ways of explaining How to Measure Gauge in a Swirl. I save this version because it has lots of photos and adds to the discussion. I’d like to start this discussion of gauge by walking you through a description of the physical forces at play in a Swirl. The dominant element of a Swirl is the welted doughnut shaped circle that provides the collar, lapels, front sides, and lower back of the garment. 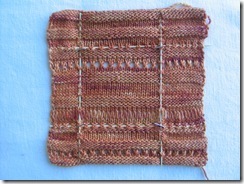 During wet blocking, the circle is encouraged to expand outward, widening the space between the welts and causing the stitches within the circle to enlarge. 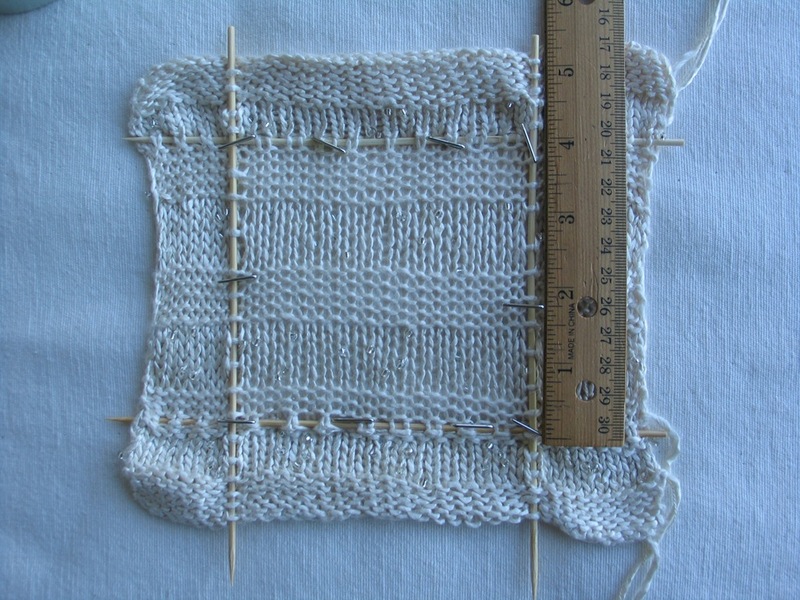 When worn, the circle is turned vertically (subjecting its stitches to the force of gravity) and wrapped around a human torso (causing some stitches to expand and others to contract.) With those dynamics in mind, let’s move on to examining some swatches, thinking about the character of the fabric and how it will respond to the forces described above. 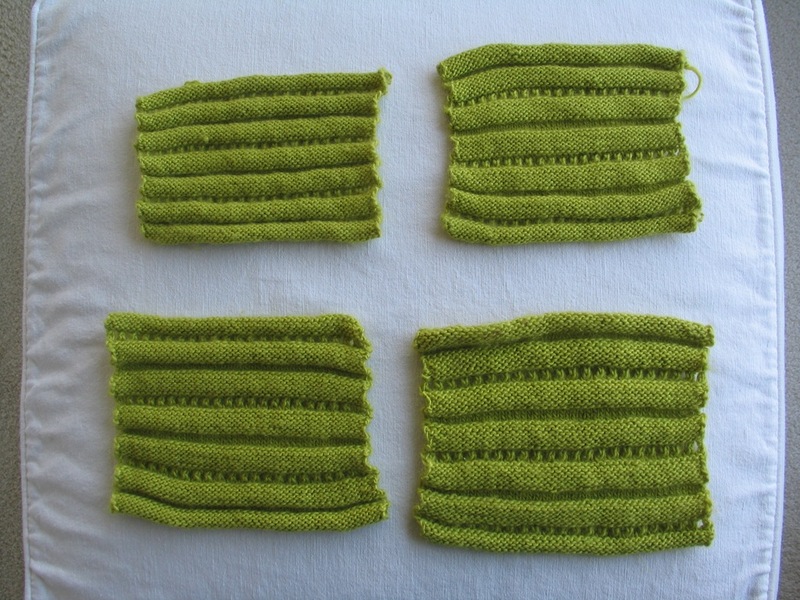 Here we have four swatches each knit without edging, roughly square and at least 8” per side, in the Going Green stitch pattern. 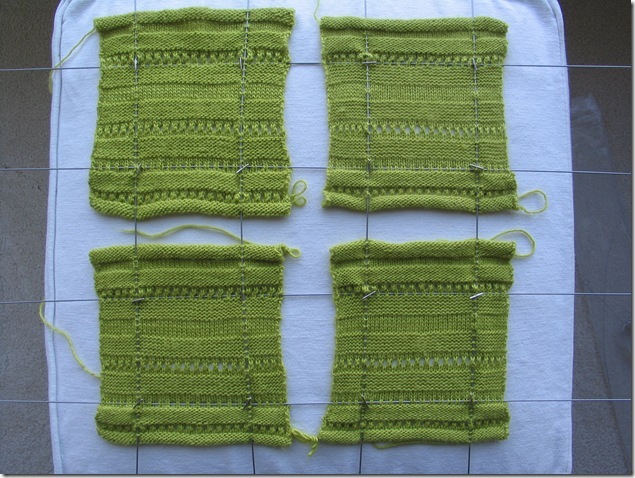 All four contain the same number of stitches and rows. The only difference between them is the size of needles used which ranged from X to X+3. 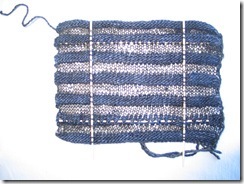 First, consider the characteristics of the yarn used here. It appears to be a woolen-spun, single-ply yarn, which tells me the yarn will readily adapt to a range of needle sizes but will also have a tendency to pill. It is composed of a 50% extrafine merino, a resilient fiber, and 50% cashmere, a less resilient, lightweight, delicate fiber. 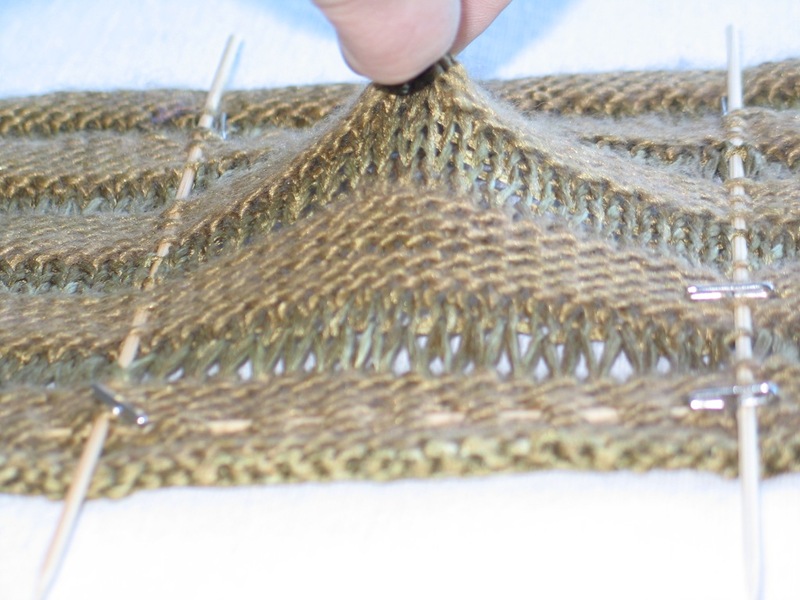 Turning to the swatches, the smallest, most tightly knit swatch displays nice sharp edges on welts that are very straight; the fabric is very springy, fairly firm, and its stitch structure is tight. 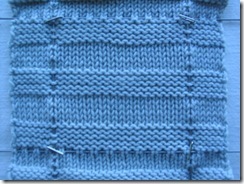 Given the resilience of the yarn, I suspect this stitch structure is tighter than necessary. 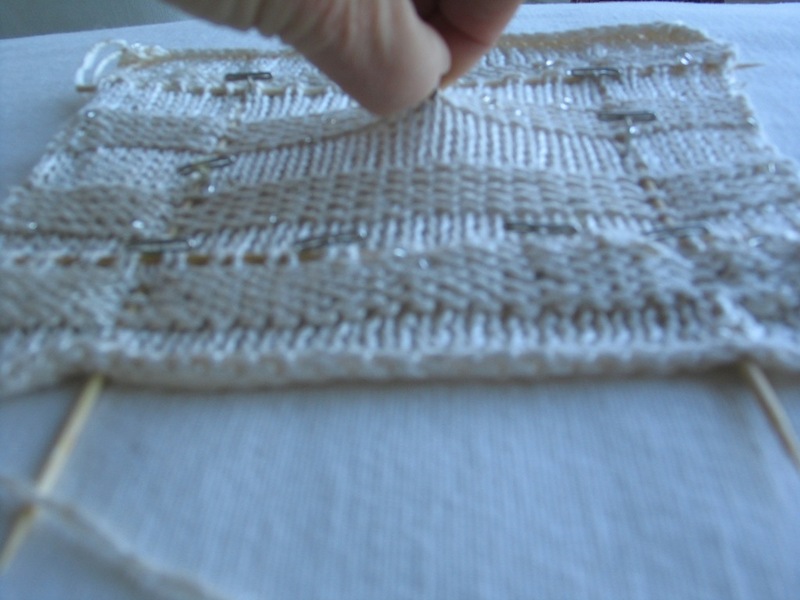 At the other end of the spectrum, the stitches in the largest swatch are loose, welt edges soft, welts appear wobbly and the fabric has a limp, flabby feel. I doubt this fabric has the structure needed in a Swirl. The other two swatches look promising. They exhibit a good balance of stitch structure and resilience, have well-formed, straight welts and result in a fabric that feels up to the task. 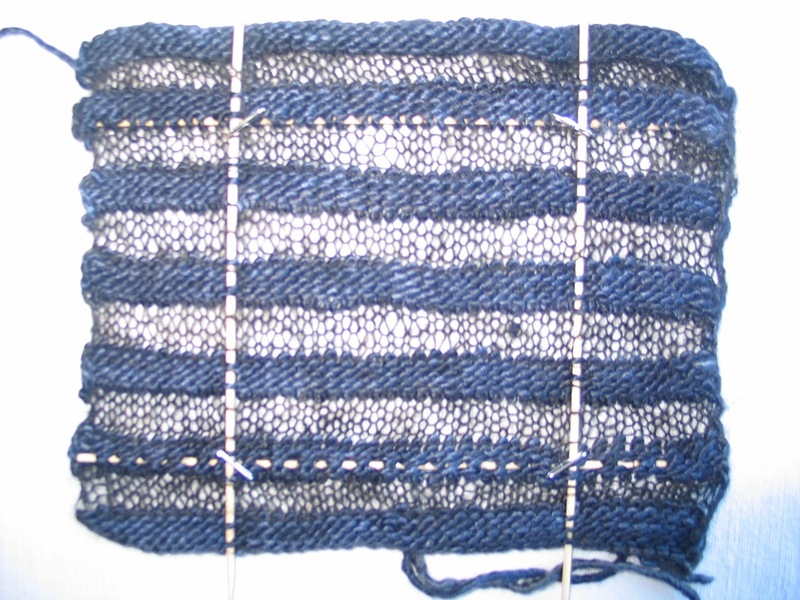 Now it’s time to block the swatches. 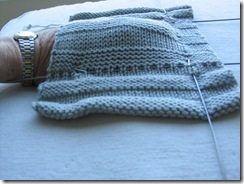 I wash swatch in tepid water, then gently squeeze and roll in towel to remove excess water. 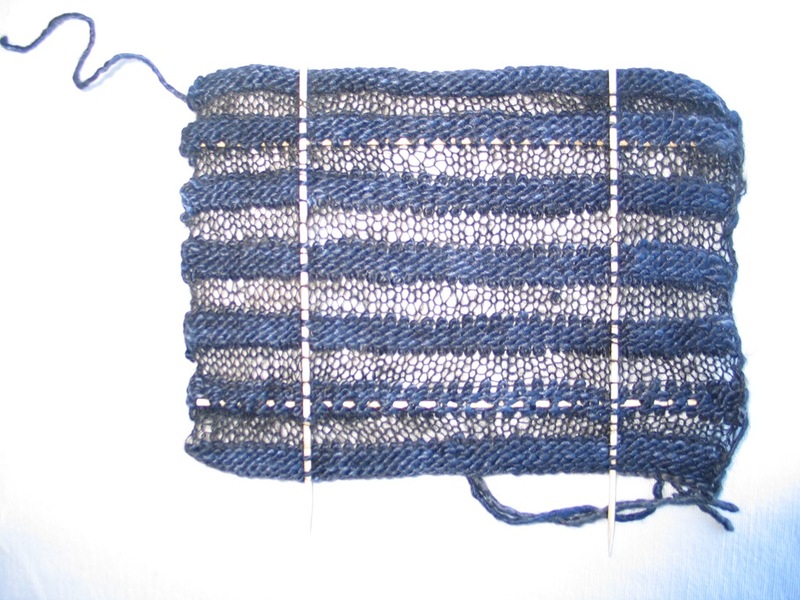 The swatches look as though they’ve been run over by a truck, so I gently toss each swatch a few times over outstretched palms to allow the fabric to regain its shape. I block only to the extent that I square up the sides and check to see that the welts are straight. I allow them to dry completely. Observing the results, I see that in general the yarn was quick to relax, the stitch structure is now more open and the welts further apart. 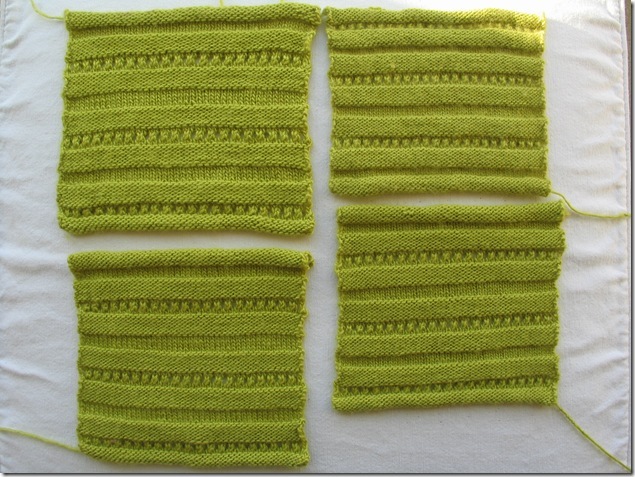 All four swatches felt less firm than they had prior to washing and blocking. 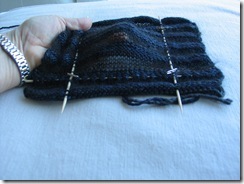 To examine the swatches further, I pin the center of each swatch to the gauge specified in the pattern. 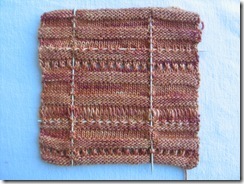 (Here I have used blocking wires to secure the edges of the swatch in this process. 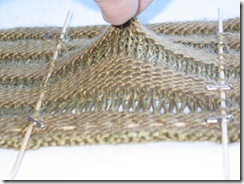 I find blocking wires, straight knitting needles, DPNs, or even bamboo skewers, do a far better job of giving an even edged result and are easier to use than pins.) 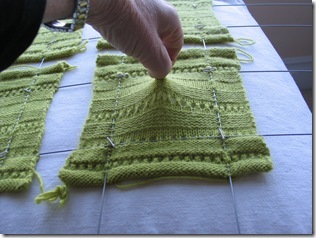 Why pin the swatch to gauge rather than employing the usual approach of measuring gauge with the swatch at rest? 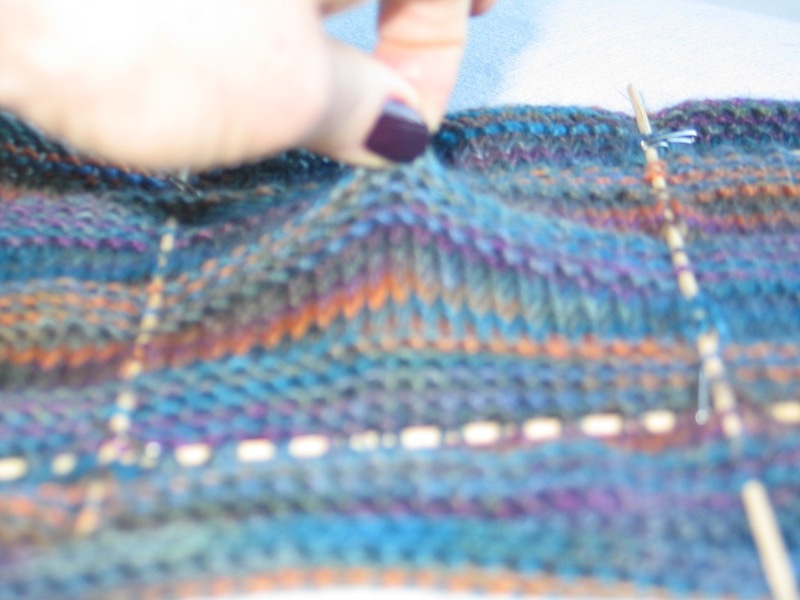 Because the goal here is to get a good sense of how that particular yarn, knit in that stitch pattern, with that size needle, will perform in a Swirl once it has been blocked and worn. Swatch One, knit with size x needle, met the stitch gauge, but put up a fight when it came to achieving the row gauge. Swatch Two, size x+1 needle, comfortably achieved stitch gauge, required a little pull to reach row gauge, but went there. Inserting my hand underneath and the administering what I call the “pinch test” told me it still had a good bit of elasticity at that gauge. 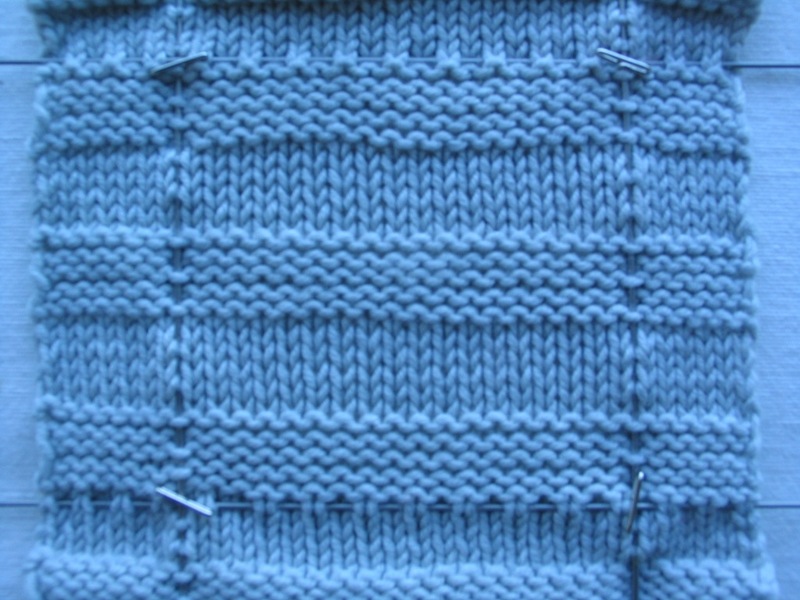 Swatch Three, size x+2 needle, required the stitches be pushed to the center a bit, but they settled comfortably to gauge when the swatch was adjusted to achieve row gauge. 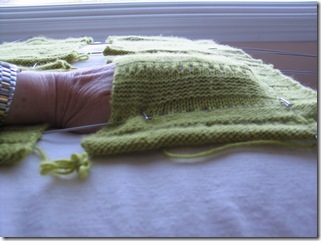 I was able to insert my hand and raise it off the surface without moving the pins in the corner—lots of give left. 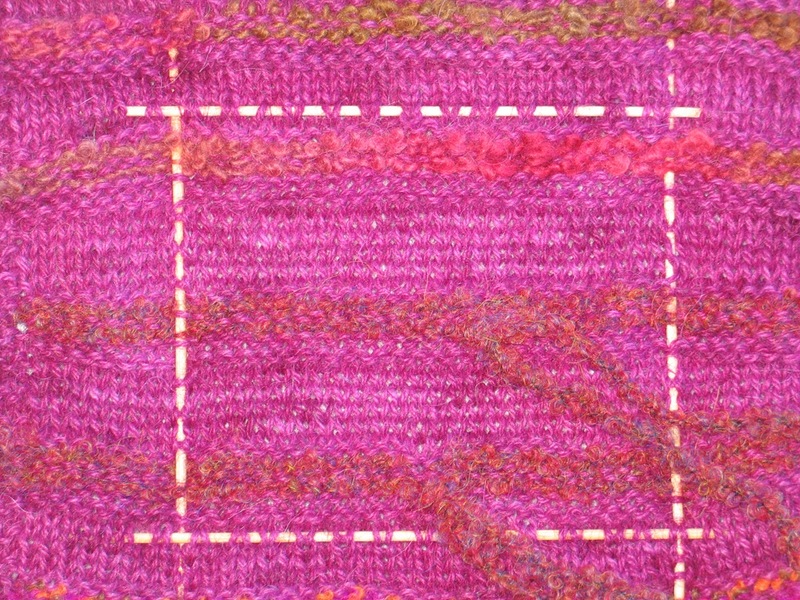 Swatch 4, size x+3 needle, required stitches to be pushed to the center significantly though it evened out when row gauge was achieved. 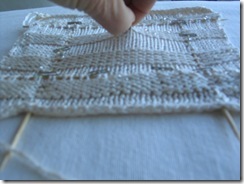 My hand slid underneath revealed a great deal of play in the fabric. Conclusions: The degree to which the swatches relaxed and opened after washing told me that the fabric will have beautiful drape but will not be quite as resilient, given its 50% merino content, as I might have anticipated. Swatch # 1 resisted row gauge to the degree that I felt it would be a good choice only for those who want a version of Going Green that is smaller and shorter than a Size One. 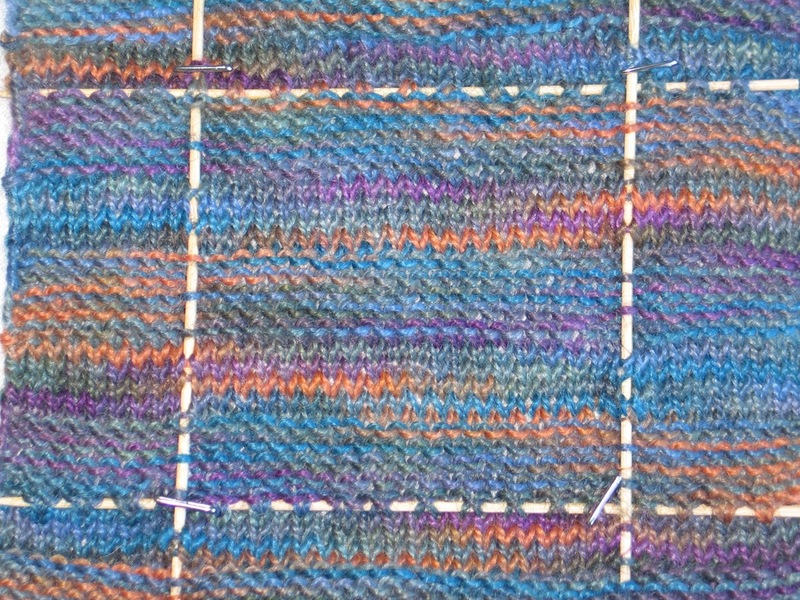 Swatch #2 was my preferred swatch because the little bit of pull necessary to meet the row gauge mimicked the stretch factor I expect to see in the final Swirl, and the degree of elasticity exhibited in the fabric after achieving row gauge told me the swatch was not overstretched. Swatch #3 had very nice qualities and would be a good choice for a knitter wishing to err on the side of ending up with a bigger, rather than smaller, finished Swirl. 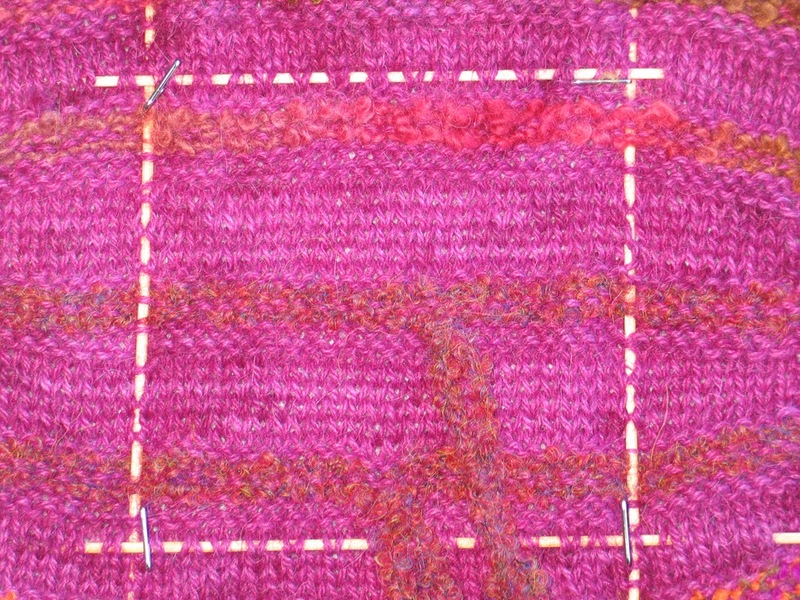 Swatch #4, after being pinned to gauge, exhibited so much play in the fabric that I felt it would result in a garment that would lack structure, develop pills readily and might also lose shape over time. 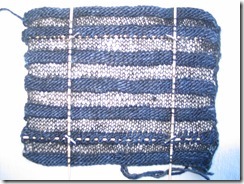 This swatch, for Winter Waves, was worked with size 8 needle. The yarn is Karabella Aurora 8, a washable, 100% extra-fine merino, constructed of eight two ply stands spun together at an acute angle. 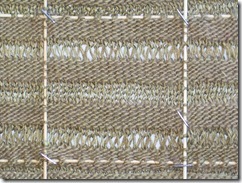 The result is a bouncy yarn that is highly and durably elastic. 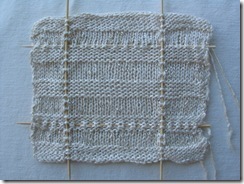 The swatch was very spongy and springy at time of knitting, with raised welts that pulled tightly together. I washed the swatch by hand and dried it in the clothes dryer to a barely damp state as this washable yarn has a tendency to grow when wet, but will come back to original size in the dryer. The washed and dried swatch relaxed and opened, yet remained highly resilient. 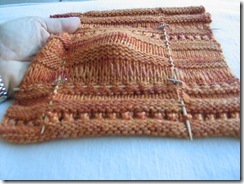 It pinned to gauge easily without adjustment, and both the hand-underneath and pinch tests revealed a fabric that stretched comfortably and sprang immediately back to shape. 100% two-ply baby alpaca presents a very different scenario. Alpaca produces luxurious, soft drape that is ideal for a Swirl. 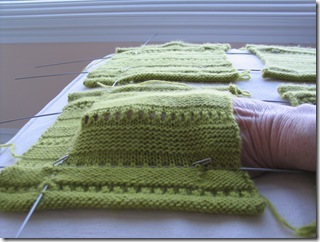 But it is also a dense fiber that, if knit too tightly, can be heavy and stretch out of shape. 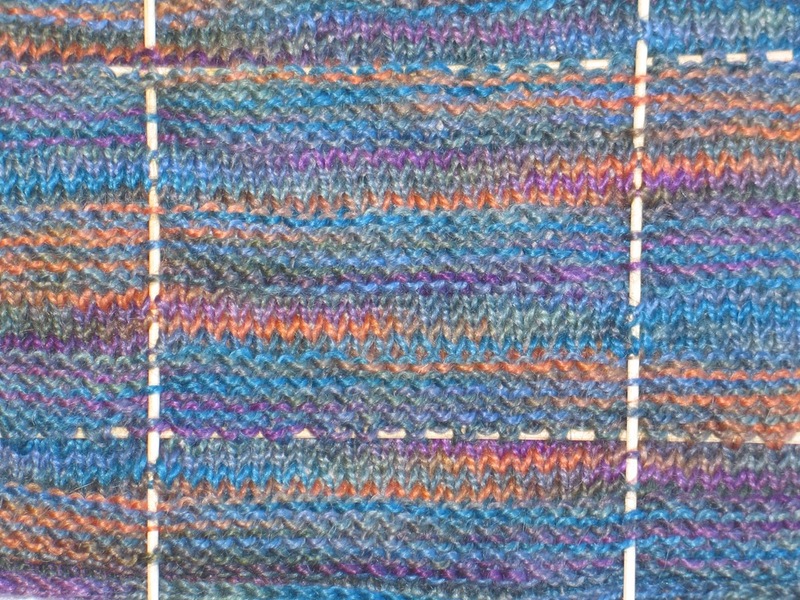 In this swatch for Sophie’s Swirl, I want a fabric with enough give to to readily achieve the stated gauge and easily respond to a pinch in the center of the pinned gauge area. On the other hand, I also still want to see nice crisp even stitches and straight welts. 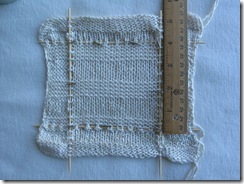 Note that there is little size or proportion difference between the first photo of the washed and blocked swatch and the second photo where the swatch has been pinned to gauge. Silk is described by Clara Parkes’ in her indispensible book, The Knitter’s Guide to Yarn, as a fiber that exhibits “slow elasticity….it’ll definitely stretch, but it’s slow to recover and may not quite make it back to the original shape.” Combine, as I did in Silken Dreams, 100% single-ply silk with alternating welts of the same yarn adorned with crystal (read heavy) beads, and you get to see silk’s tendency to stretch writ large. I designed this Swirl for my daughter to wear on her wedding day. It ended up longer than I ever dreamed possible, but that gave it a long elegant profile and the ability to flow gracefully over the folds of her gown. 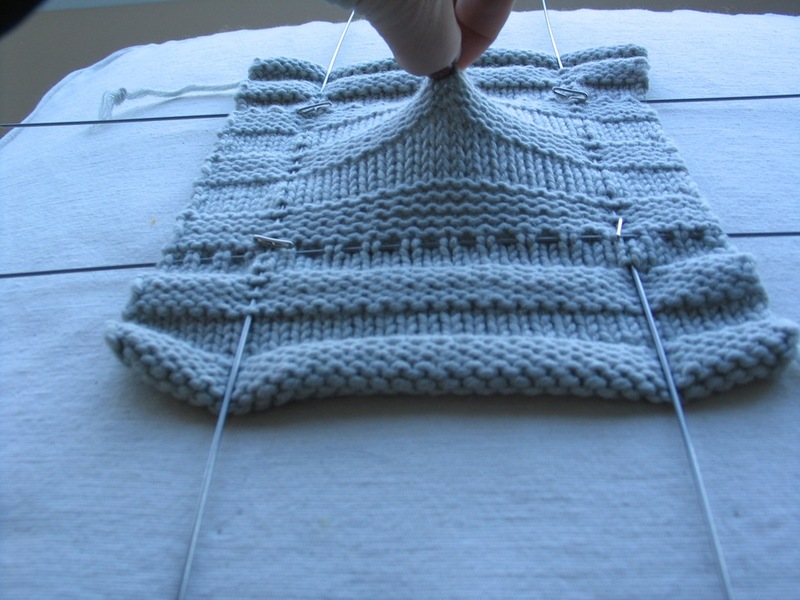 Keep the “slow elasticity” factor in mind as you coax (ok, stretch) your swatch to achieve the gauge specified in the pattern. 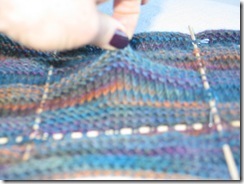 It will eventually achieve row gauge, as will your silk Swirl when gravity has its way. Note the minor amount of give demonstrated in the pinch test. The yarn used in Tangerine Rose is a relatively tightly spun single-ply 50/50 blend of merino and silk. The energetic resilience of merino does a great job of balancing the “slow elasticity” of silk we just discussed. The resulting fabric is strong with excellent drape, sheen and durable elasticity. 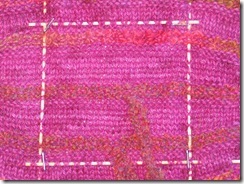 This merino silk combination should readily achieve pattern gauge without coaxing. 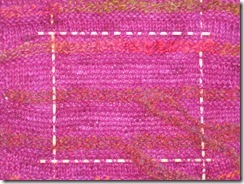 Note: The stitch pattern for Tangerine Rose calls for two alternate stitch patterns. Make sure to include both alternate patterns in your gauge sample. Sheer Beauty presents an unusual fabric in which dense welts, with firm stitch structure, alternate with sheer welts of decidedly loose stitch structure. The resulting fabric is surprisingly elastic, thanks to the resilient 70% wool/30% silk combination in the heavier welts and the 60% mohair/40% silk blend in the translucent welts. 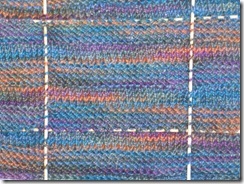 The swatch fabric relaxes fully when washed and achieves gauge readily. 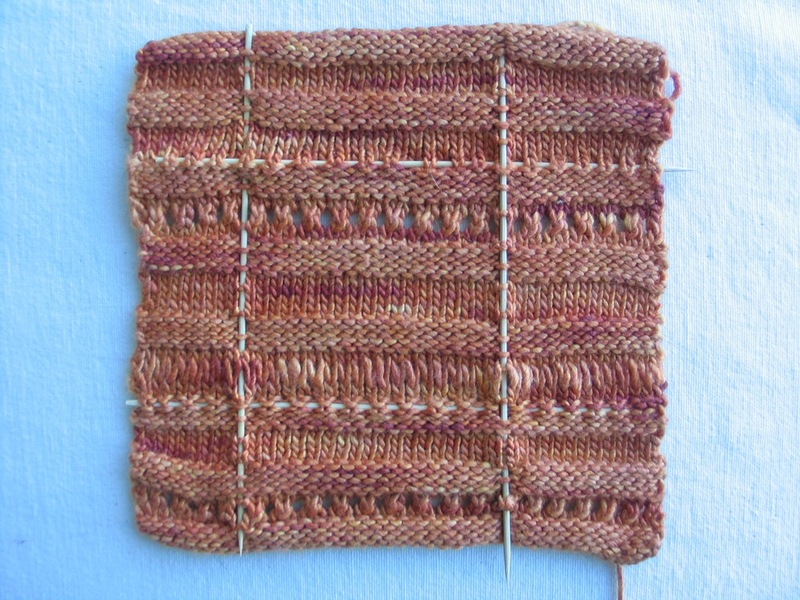 The photos of this swatch for Coat of Many Colors offer a great example of the shift that often occurs when pinning a swatch to the gauge of a pattern. 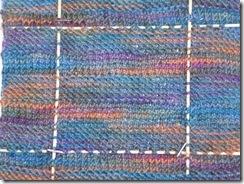 The photo on the left shows that the swatch at rest is wider than it is tall. 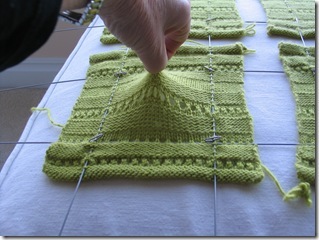 Once the swatch is pinned to gauge, the number of rows per inch is reduced and the number of stitches per inch increases. This also occurs when the Swirl fabric is blocked out and gravity does its thing. 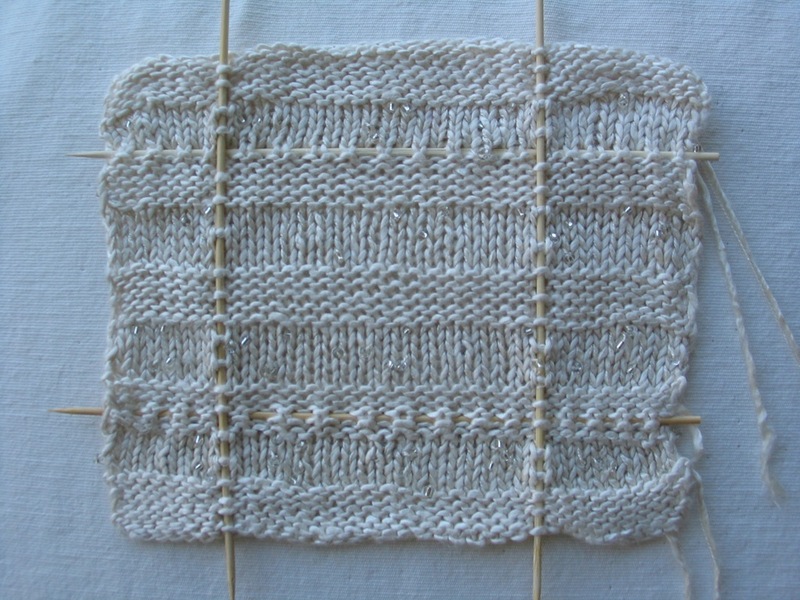 The yarn used here is a very resilient blend of wool and mohair that results in a fabric that readily achieves gauge and produces a fabric that is durably elastic. 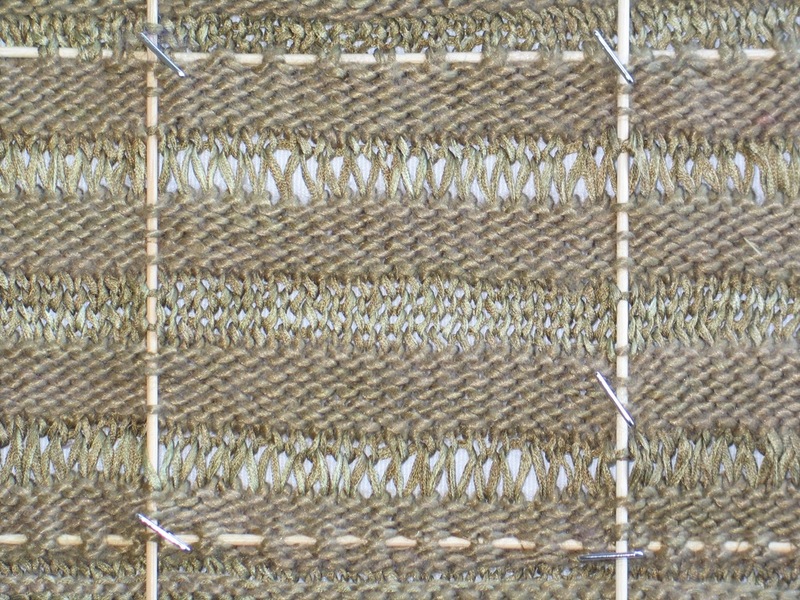 The fabric in Golden Glow gets its character from an unusual yarn: Alchemy’s Silken Straw, a fused ribbon yarn of 100% silk that initially looks and feels like straw, but becomes soft and pliable as it moves through your hands. 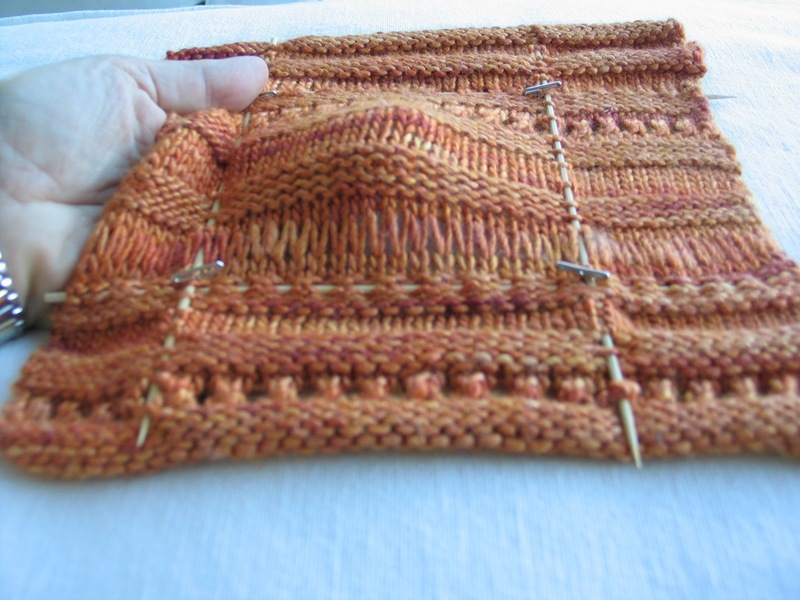 This stitch pattern uses a Condo Row stitch in which one larger needle substitutes for a smaller needed to create a long V-shaped stitch. 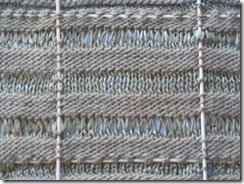 Alternating welts are knit using a 50/50 merino-silk single-ply blend. 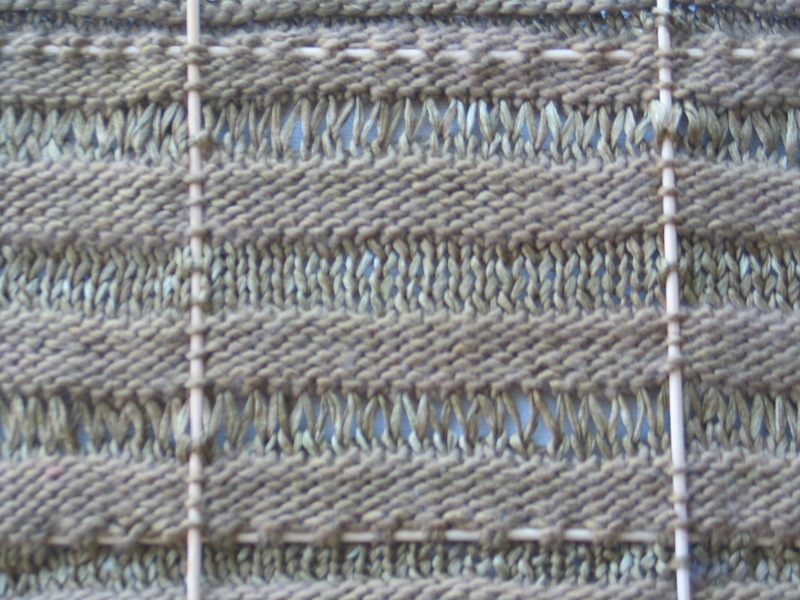 The two yarns together produce a fabric of moderate elasticity even after the swatch is pulled taut in order to achieve gauge and anticipate the stretch of the silk over time.